This year marks the 25th Anniversary of the Power Rangers and Hasbro chose to celebrate by bringing 25 different helmets, one for each year of Power Rangers, to their display booth at this year’s Power Morphicon! Those with keen eyes will recognize the display pieces coming from the original offices of Saban Brands which shut down earlier this summer when Hasbro purchased their entire catalogue of intellectual properties. Check out each and every helmet by clicking the title of the story! New Dino Charge & Super Megaforce Toy Images! Courtesy as always of @razzle1337 on twitter, we have some more new Power Rangers toy images! On the Dino Charge side of things we have our very first look at the upcoming Dino Charge rangers 6-pack! But wait! 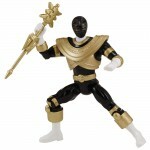 That’s not a Gold Ranger in the 6th spot, but instead a villain. Astute fans of Kyoryuger will no doubt recognize this character as Dogold from the Deboss Army and understand why he’s been included in this set. His Power Rangers counterpart name has yet to be confirmed. Also included is the combined team weapon also yet to be named (Kentrospiker in Kyoryuger). And we also catch a glimpse of the Dino Charge Red Ranger mask from the Ranger Training set! For Super Megaforce there’s actually quite a few new images to behold! All of the Wave 4 Ranger Keys packs. 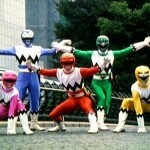 Mighyt Morphin, Operation Overdrive, Alien Rangers, Jungle Fury, Dino Thunder, RPM! 12″ figures of Megaforce Red & Super Megaforce Silver Rangers. Ultimate Legendary Megazord 3-pack! This massive 3-pack will contain the Legendary Megazord, Q-Rex Megazord, & Turbo Falconzords all needed to create the final Ultimate combination! Our exclusive coverage begins Tuesday, July 22nd. Ahead of it’s air date tomorrow morning, the official Power Rangers youtube page has just uploaded a new clip from Power Rangers Super Megaforce’s 6th episode “Spirit of the Tiger”! In this new clip we see Jake & Emma, under the guidance of Casey/Red Jungle Fury Ranger, learning to tap into their inner animal spirits. The next batch of items being billed as Legendary items are the upcoming 5″ figures of the Red Rangers and a select few popular 6th Rangers from various seasons of Power Rangers. Thanks to our friends at Samuraicast Blog as well as Megaforcecast Blog and Gallery for finding these great images, it’s your first look at these highly anticipated figures! High resolution images of the following anniversary figures are included in this news post! And don’t forget – we’ve already seen images back in December for the Legacy 5″ Mighty Morphin Red, Green, and White Rangers! There should be more to come soon as we saw even more than that at Toy Fair 2014 … (come on Titanium Ranger, where are you?). Click the title of the news story to check out all the images! Again, a special thanks to Samuraicast Blog and Fury Diamond for the find on these images. With the premiere of Power Rangers Super Megaforce slated to begin airing in February 2014 on Nickelodeon, it was only a matter of time before story titles, summaries, and of course, spoilers began to hit the Internet. And, thanks to our friends at RangerCrew, Funaroboard, and @nightmere10 and The Power Scoop, we can share some of the details of those spoilers with you now. The episode summaries have been passed on to certain individuals who have chosen not to release them (yet). But they did give us a few things to tide us over until they do release them. We’re only posting them because for the last couple of years these early spoilers have been 100% dead-on in accuracy, so we’re calling them spoilers and things that will happen. Read on to find out! And for some details from the episode summaries, check out the descriptions below. As soon as full summaries are made available, we will share them with you! What do you think? Join in the discussion below and post what YOU hope to see from this season of Power Rangers! 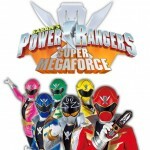 Power Rangers Super Megaforce looks to premiere in mid-February 2014 on Nickelodeon[/b[. Everyone is well aware of the tweeted photos of Ciara Hanna (Yellow Ranger in Power Rangers Megaforce) and Jason Smith (Red Ranger in Power Rangers Jungle Fury). But now thanks to Fury Diamond and his blog at RangerCrew, we can shed more light on what exactly Jason Smith is doing in Power Rangers Super Megaforce. 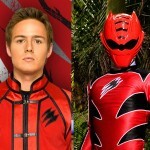 Jason Smith, or Casey the Red Ranger in Power Rangers Jungle Fury, is going to have his own tribute episode in Power Rangers Super Megaforce. But more than that, Jason Smith is also now WRITING episodes in Power Rangers Super Megaforce. That’s an interesting development – return for a tribute and stay on board to write some episodes. 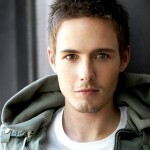 Jason Smith is a Power Rangers and Super Sentai fan, having watched GoBusters and the current Kyoryuger series in Japan. What do you guys think? Is having a Power Rangers Alumni write episodes for Power Rangers a good thing? Discuss away! 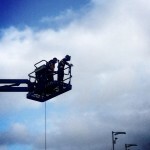 [UPDATE] Wild Force Black Ranger Spotted At Super Megaforce Filming & More! Filming for the second half of the 20th anniversary Power Rangers series, Power Rangers Super Megaforce, is underway and what exactly this half-season will contain is still being widely speculated. We’ve been told it will be adapted from Super Sentai series Kaizoku Sentai Gokaiger, however to what lengths is still unknown. Twitter user @donas007 has posted a picture from filming that reveals the Wild Force Black Ranger at the scene. Will he be a “guest ranger” appearing or is this simply more proof that the Megaforce rangers will gain the ability to morph into past rangers? Speculate away! EDIT: More Super Megaforce hints have come in the form of yellow ranger actress Ciara Hanna posting a picture of herself with Red Jungle Fury Ranger actor Jason Smith on Instagram! Meanwhile, red ranger actor Andrew Grey posted his own backstage picture, showing off the V-Weapons from Power Rangers Time Force. The Red Rangers Tour New York City! 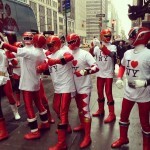 The Red Rangers hit the streets of New York City to celebrate the 20th Anniversary of Power Rangers! Because everyone deserves a vacation especially Earth’s Defenders. Thanks to Tokunation Member Eric for the heads up! Hey Power Rangers fans! Happy New Year to you and to everyone, but the big news of the year is the fact that this year the Americanized adaption of Super Sentai, Power Rangers, is celebrating it’s 20th birthday this year. To honor that milestone, TokuNation.com is celebrating 12 of your favorite Power Rangers seasons all year long! You may have noticed the graphic change in the upper right corner of our site. That’s because for January, we’re going to celebrate Power Rangers Lost Galaxy. Later this month stay tuned for a massive update about all things Power Rangers Lost Galaxy, from the show to the merchandise to the actors and actresses on the show. Join us in our celebration! GO GO POWER RANGERS!